I am a choreographer, performer, teacher, and researcher. I was fortunate to start dancing when I was 7 years old in my birthplace of Tegucigalpa, Honduras, where I took ballet and modern dance classes with teachers Judith Burwell, Roberto Silva, and Claudia Zelaya, among others. I moved to Mexico City to continue my dance training in Limon and Release techniques. I graduated from the Choreography Program at the “Centro de Investigación Coreográfica” based at the National Institute of Fine Arts (INBA) in Mexico City, and the Somatic Research and Participatory Arts Program at the “Moving-on-Center” in Oakland, California. In 2011, I graduated from the Body-Mind Centering certification program in Developmental Movement, and I was fortunate to study directly with the founder of the technique Bonnie Bainbridge-Cohen. Through the same program I also obtained a 200-hours yoga teacher certification. I have worked as a performer and choreographer for 20 years in professional dance groups in México (Caída Libre, Luna Roja, and Mandinga), and Honduras (Danza Libre), performing in venues and festivals in Central America. I felt honored to take classes and collaborate with wonderful teachers and performers such as Oscar Velázquez Guerrero, Ana González, Sara Buck, and Isadora Paz. 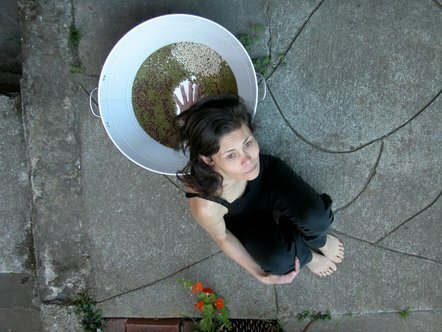 I moved to San Francisco, California in 2008, where I have developed choreographies based on somatic explorations, with a focus on my migration experience. I have appreciated collaborating with artists Bonner Odell, Elizabeth Boubion, Aya Chigusa, Maryann Brooks, Cathie Caraker, Rosemary Hannon, Joyce Lu, Christine Germain, Joy Cosculluela, among others. I have presented my work in venues in the San Francisco Bay Area including NohSpace, Dance Mission Theater, Counterpulse, Moments Notice, TheOffCenter, The Garage, and the Safe House Arts. I have taught contemporary dance (Limon technique) and experiential anatomy classes at Centro Cultural Los Talleres in Mexico City for four years, and contact improvisation and dance based on Body-Mind Centering@ principles at Counterpulse, the West Coast Contact improvisation Jam in Berkeley, the Performatica Festival at the University of the Americas in Puebla-Mexico, the Department of Arts at the National Autonomous University of Honduras, and the Center for Dance and Movement Research at the University Rafael Landivar in Guatemala. For four years, I taught regular dance classes based on somatic principles to women who were recovering from drug abuse and domestic violence through the non-profit organization Purple Moon Dance Project based in San Francisco. I taught a weekly chair yoga class for seniors at the Bernal Heights Neighborhood Center in 2012. I have also led workshops on body awareness and improvement of balance for elders. Since 2012, I teach bi-lingual weekly classes to improve coordination, strength, and balance for elders at Bethany Senior Housing Center, 30Street Senior Center, and Bethel Center through the program Always Active in San Francisco, and since January 2018 I became a staff member for the Always Active Program at Onlok. I am faculty at the Older Adult Department of City College of San Francisco where I teach BodyDynamics and Aging Process I and II. During the last three years, I have organized and curated along with Miriam Wolodarski and Cathie Caraker, the Salon a space in which artists present their work in progress and audience provide feedback in an intimate way. I also have serve as media outreach coordinator for the Festival for Latino American Contemporary Choreographers, in the San Francisco Bay Area. I hold a first professional degree in Medicine and a M.S. degree in Population and Health from Universidad Autonoma Metropolitana in Mexico. Moreover, I have developed a career as a researcher in reproductive health. My professional training in research informs my somatic practice and teaching. At this time, I am studying a Kinesiology program with movement science emphasis at San Francisco State University.